A bundt cake is instantly recognizable by its pretty fluted design. I like how it makes a cake look extra special. 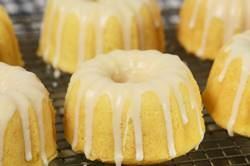 For this recipe we are making individual Vanilla Bundt Cakes. The cakes are buttery sweet with a texture that is wonderfully dense and moist. While perfect on their own, I couldn't resist pouring a Vanilla Glaze over each cake that dries to a beautiful hard matte finish. These are Pound Cakes. The batter is mixed using what we call the 'one bowl' or 'quick method' (also more commonly known as a 'dump' cake). This means all the dry ingredients are first put into a mixing bowl and the liquid ingredients are beaten into the batter. This method reduces the gluten formation in the flour thereby producing a dense cake with a soft and tender crumb. The important thing is to follow the mixing instructions and don't overwhip the batter as this will cause the cake to rise too much during baking and then collapse while cooling, producing a gummy layer. The cakes are baked in a six - one cup (240 ml) bundt pan. It is important to generously butter and flour each cavity (or use a cooking spray that contains flour) so the cakes won't stick in the patterned depressions. If you are using a dark colored pan reduce the oven temperature to 325 degrees F (165 degrees C). The reason we do this is because a dark colored pan absorbs more of the energy coming from the oven walls so it becomes hotter and transmits heat faster than a light colored pan. Reducing the oven temperature slightly will help compensate for this. Vanilla Bundt Cakes: Preheat your oven to 350 degrees F (180 degrees C). Butter and flour (or spray with a vegetable spray that contains flour) a six - one cup (240 ml) bundt pan, available on Amazon. In the bowl of your electric stand mixer, fitted with the paddle attachment (or with a hand mixer), place the flour, sugar, baking powder, and salt. Mix on low speed until combined. Add the butter and mix on low speed until the dry ingredients are moistened and have a mealy consistency (looks like wet sand). (Batter will just start to form clumps.) Add the eggs, one at a time, and mix (on low speed) until batter is smooth. Then increase the mixer speed to medium high and beat for about one minute to aerate and develop the cake's structure. Scrape down the sides and bottom of the bowl as needed. Add the milk and vanilla extract and mix to combine. Place the batter in a pastry bag fitted with an 1/2 inch (1.25 cm) plain pastry tip and pipe the batter evenly into the six bundt molds (115 grams in each mold), and smooth the tops. Bake for about 16 - 18 minutes or until a toothpick inserted into the center comes out clean. Remove the cakes from the oven and place on a wire rack to cool, in the pan, for about 10 minutes. Then remove the cakes from the pan to finish cooling before frosting. Vanilla Glaze: Place the confectioners sugar in a small bowl. Add the vanilla extract and about 2 tablespoons of the cream and whisk until you have a thick and smooth glaze. Add more cream or powdered sugar, if needed, to get the correct pouring consistency. Slowly pour the glaze over the tops of the cakes, allowing it to drip down the sides. Let the frosting dry before covering and storing. The cakes will keep about 4 days at room temperature or about 5 to 7 days in the refrigerator. Can also be frozen. Makes six mini bundt cakes.